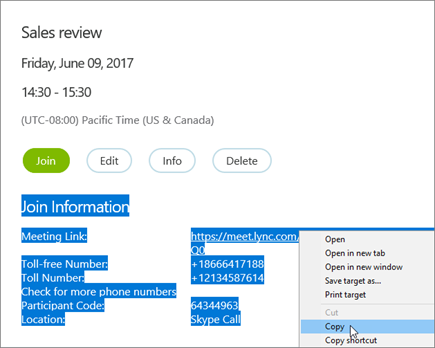 Skype for Business Web Scheduler is a web-based program that you can use to create Skype Meetings if you don’t have Outlook, or don't have a browser that supports Outlook Web App. With Skype for Business Web Scheduler, you can create new meetings, change your existing meetings, and send invitations with your favorite email program. If that doesn't work, contact your workplace technical support for the Skype for Business Web Scheduler address in your organization. 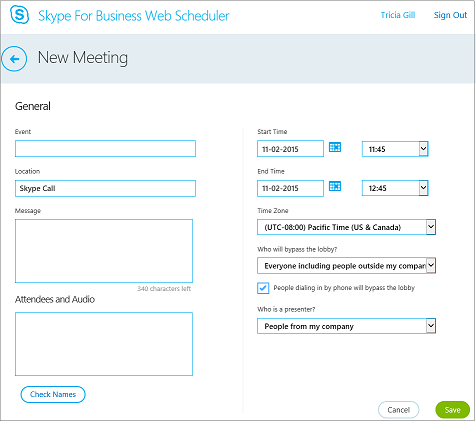 When you sign in to the Skype for Business Web Scheduler, you'll go straight to the New Meeting page. Enter an Event title for your meeting. You can leave the meeting location as Skype Call, or add a location, such as a conference room, if you have in-person attendees as well. Enter meeting details in the Message box, and set the start and end date and time. Under Attendees and Audio, add the attendees’ names or email addresses, separated by semicolons (;). (Optional) Select Check Names to verify the addresses of the participants who are in your organization. Accept the standard settings, which are best for small working meetings with people inside your organization. Choose other lobby or presenter options depending on the type of meeting you want to schedule. Only people who were invited can join the meeting directly. Everyone else has to wait until admitted. Check the box next to People dialing in by phone will bypass the lobby if you want your dial-in callers to go straight to the meeting. To send the meeting request, you can copy the meeting details and paste them into an email program, or save the details in iCalendar format send it as an attachment. When you’ve finished creating the meeting, select Save. You'll see a confirmation page that lists your meeting details. Click the X to close the confirmation page. 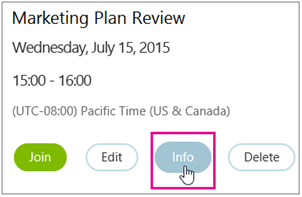 On your My Meetings page, highlight the meeting information, right-click, and then choose Copy. Open your email program and create a regular meeting request. Paste the meeting information into the request. Add the participants' email addresses to the message, add the meeting date and time, enter a meeting agenda, and then send the request. In the My Meetings section, select the meeting by its subject, and then select Info. At the bottom of the meeting invitation window, select Export as iCalendar. When prompted by your web browser to either open or save the iCalendar file, select Save. Create an email message and add the iCalendar file you just created as an attachment. Tip: Learn how to insert an attachment in Outlook or Outlook Web App. Enter the meeting participants, meeting title, and a message as appropriate, and then send the email. When participants open the iCalendar file, the meeting is automatically added to their default mail or calendaring program. Open the email meeting request and select the meeting link. Open Skype for Business Web Scheduler, select the meeting you want from the list on the left, and then select Join in the meeting summary pane. 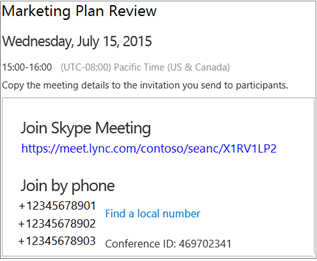 To view a meeting's details, open Skype for Business Web Scheduler and select the meeting title on the left. 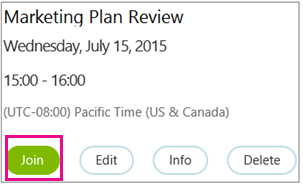 Skype for Business Web Scheduler lists only the meetings you've scheduled, not all the meetings on your calendar. 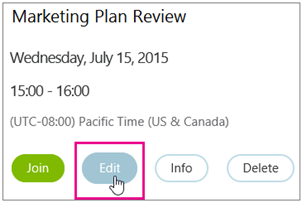 Select Edit or Delete in the meeting summary pane. After you've made your changes, send the participants either the updated meeting information or a notice of the meeting cancellation. Important: Skype for Business Web Scheduler doesn’t update your calendar automatically, so participants must be informed of every change you make.